CrushClans – How to remove? 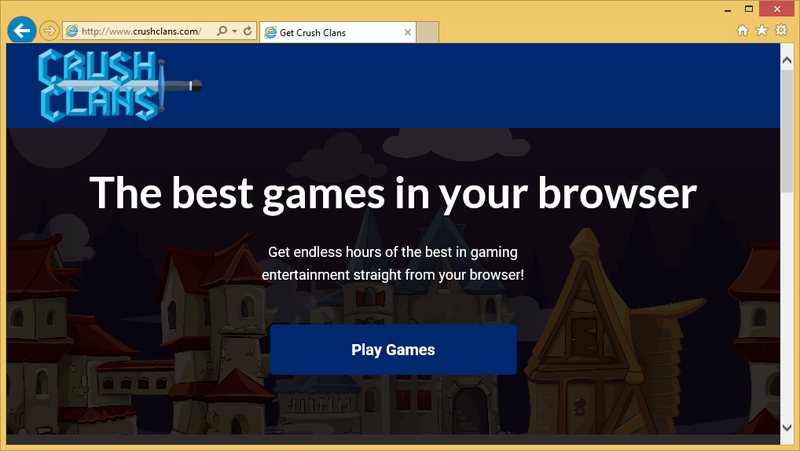 CrushClans is considered to be an adware application that can enter your computer via software bundles. There is also an official website where you can download this browser add-on. Supposedly, it will allow you to access online games via your browser. It will also generate huge amounts of ads so that it could generate pay-per-click revenue for sponsored websites. It will not harm your computer directly as it is not a malicious computer virus, but the ads will frustrate you. While you might not think you need to delete CrushClans urgently, we suggest you do it as soon as possible. Adware can expose you to dangerous content that may lead you to malware. In any case, the ads will annoy you until you remove CrushClans. Why do you need to uninstall CrushClans? CrushClans is available for download on the official website (crushclans.com). It can also enter your computer via freeware. Adware, browser hijackers and other kinds of unwanted items are attached to freeware and that allows them to install automatically with the free software, unless the user manually deselects them. The mistake that allows those items to install is Default settings. Default mode does not allow you to deselect anything and does not even inform you of any attached items. What you need to do is use Advanced (Custom) settings. In them, you will be able to uncheck all added items and will not have to remove CrushClans or similar items. CrushClans adware is not malicious, you don’t need to worry about it deleting files or stealing your personal data. It claims to allow you to play online games but it will also make intrusive ads. Those ads will appear everywhere you go on the Internet and flood your screen with offers, deals, downloads, etc. It’s a Google Chrome add-on, so that is the only browser than can be affected. However, that does not mean you should abandon Chrome and choose a different browser. The sooner you erase CrushClans, the better. Ads by adware are created so that you would be redirected to sponsored web pages, and so that it can generate pay-per-click revenue. You should refrain from clicking on any ads by crushclans because they might not always be safe. Adware does not pay attention to what kinds of domains you are exposed to so you could eventually end up on a dangerous one. If you were to enter an infected website, malware could sneakily enter your computer. If you want online games, you can find them via search engine, you don’t need an application for that. Therefore, we suggest you uninstall CrushClans. Manual CrushClans removal is possible and that is the recommended choice for those who are not experienced with computers. If you do not feel confident you can delete CrushClans fully yourself, choose the removal tool. However, we will provide instructions to help you eliminate CrushClans by hand.